Then, she joined the Coast Guard and chose the medical corps to contribute in a different way. 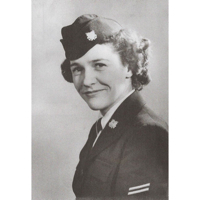 She remembers 100s of women on the train going to the all-male Coast Guard base on Manhattan Beach, Sheep’s Head Bay, Brooklyn, and when they arrived,they were the first women, and guards surrounded the base to keep men out. They marched constantly, it was January and snowy, they did not have uniforms, and women who had only high heels had to march in them everywhere. “It was one more way to do whatever we could to bring our boys home,” she says. She was assigned to a naval hospital in Philadelphia where she fell in love with a West Virginia soldier, Earl Curnutte, who had lost his right leg and “had his foot torn up” at Okanawha. He told her she had to lie on her back to see the tops of the mountains, and she believed it. He was discharged in May, 1946, and Earl started writing in July. They were married July 29, 1947. He had spent two years in the hospital, where they saved his left leg from deterioration from osteomylitus, caused by debris when his foot was hit. He was written about in the book, The Killing Fields of Okanawha, by James H. Hallas. Since 2010, “Buddie” has served on the Board of Directors for Thanks! Plain and Simple, Inc., (“Thanks!”), a nonprofit organization with the mission of creating model projects that need to be done in America. With her abilities to communicate with Rosies and the public, she has significantly helped “Thanks!” develop the first Model Rosie the Riveter Community in America as well as to help the total project to include Rosies in making decisions about how their legacy will be passed to the future. She is one of 31 Rosies in the organization’s highly-respected documentary film, she is chairman of the Rosie the Riveter Park Committee which is the first park designed by Rosies in America (see website), and she facilitates communications with Rosies and others who help show what America can do with Rosies. My mother was in Morgantown, WV and became a Rosie Riveter in Akron, Ohio. She eventually became an inspector. If you have more information on her, please let me know.Her full name was Virginia Dare Salisbury Badzek, born in Webster County.